I'm not very adventurous in the kitchen. Oh sure, I'll try just about any recipe I come across that sounds good, and I can follow them all to the letter. Over and over again. I rarely get experimental. I have a hard time breaking the rules, even after all the years I've been cooking. I like to think I'm getting better though. Experience builds confidence, right? 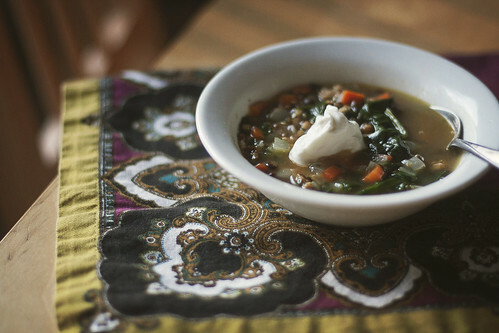 Which is where this lentil soup comes in. I've given you the recipe for this once, and it's a totally fine recipe. But see, I really like this soup and I've made it a lot. And I also found some chicken italian sausages at Trader Joe's that I really like. So I tried them in the soup (instead of the ham the recipe calls for or the pancetta I usually end up using), and I REALLY liked the result. Since I normally make this soup to bring as my lunch, I wanted to add something green to it, and make it more of a one pot meal. Hello, spinach! A few handfuls thrown in right at then end wilt down and make this the perfect lunch (or anytime) soup. So, I know you could probably figure it out just from the text above, but I'm going to give you the revised recipe anyways, because I know some of us like to have the rules (and there's nothing wrong with that). Adapted from "Cooking with Everything Trader Joe's"
Heat large saucepan over medium high heat. Add the italian sausage to the pan, breaking it up with a wooden spoon as it cooks, until most of it starts to brown. Add onions and carrots and cook for 10 minutes or until onion softens. Stir in cumin and salt, cook for 1 minute. Add broth, lentils. (This is a good time to scrape any brown bits form the bottom of the pan.) Bring to a boil for one minute. Add spinach, a few handfuls at a time. As it wilts down, add more until your desired amount of spinach has been added. Remove from heat and stir in lemon juice, Add salt and pepper to taste. Garnish with sour cream and cilantro. Prep and cooking time is about 20-30 minutes. Serves 4-6 (or lunch for 4 to 5 days).